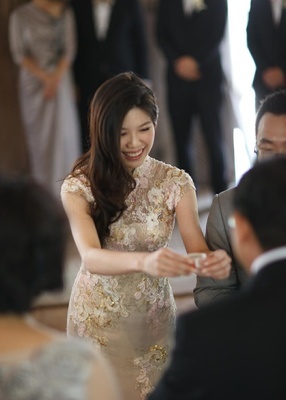 Each time Gladys Tso lost a hand during a particular game of competitive poker, fellow player Henry Zhang insisted on replacing her chips with some of his own. Far from appreciating the gesture, Gladys found it a tad condescending, and looking back, Henry admits his early attempts to win the heart of his Stanford University classmate were probably misguided. “The more I tried to get her attention, the more I seemed to drive her away,” he smiles. 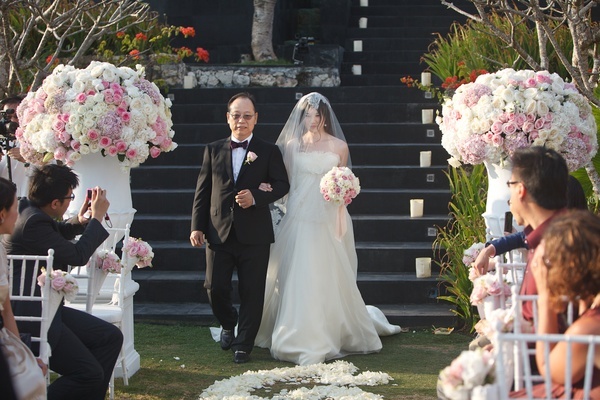 Fortunately, the two eventually connected; and after several years of dating, Henry proposed marriage. 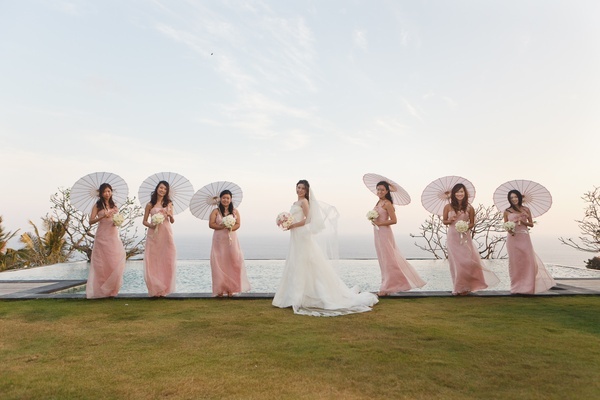 Having enjoyed numerous weekend getaways to Bali since settling together in Hong Kong, the couple had noted long before they were engaged that the island would be a lovely locale for a wedding. 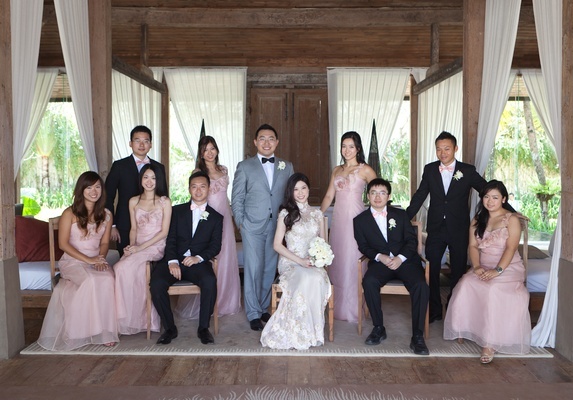 The couple decided to limit the guest list for the celebratory weekend to their closest friends and family members, and then hold a separate banquet in the groom’s native city of Beijing three weeks later for extended relatives and other individuals close to the family. 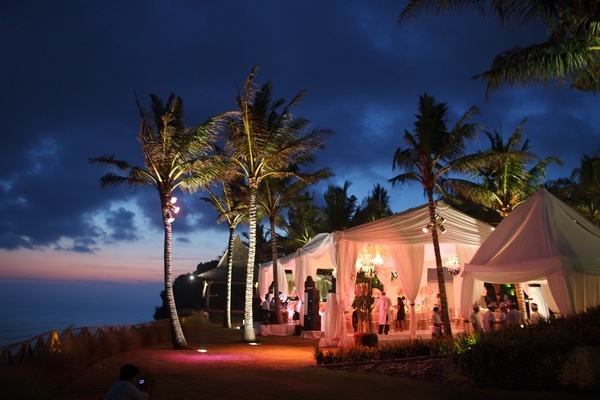 An exclusive estate overlooking the Indian Ocean offered the ideal setting for the intimate event the pair envisioned. 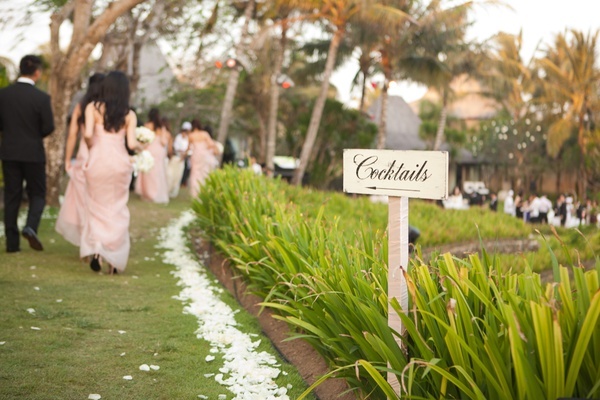 “We fell in love with it instantly upon entering the property,” explains the bride of the Javanese premises. 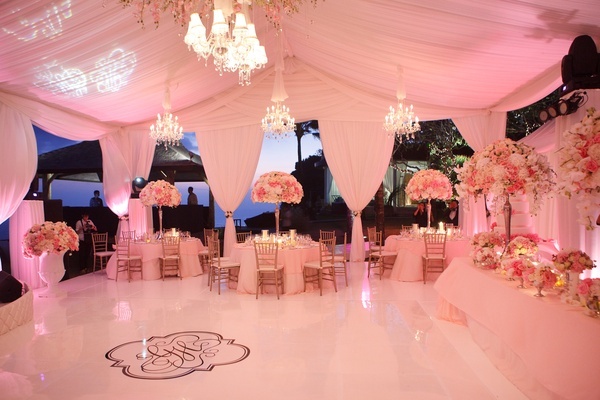 “It was relaxed but luxurious.” Terraced levels on the grounds of the estate offered progressive event sites, beginning with an uppermost pavilion perfect for the couple’s ceremony; a mid-level lawn area for the cocktail hour; and a landscaped lower plane for the tented reception. 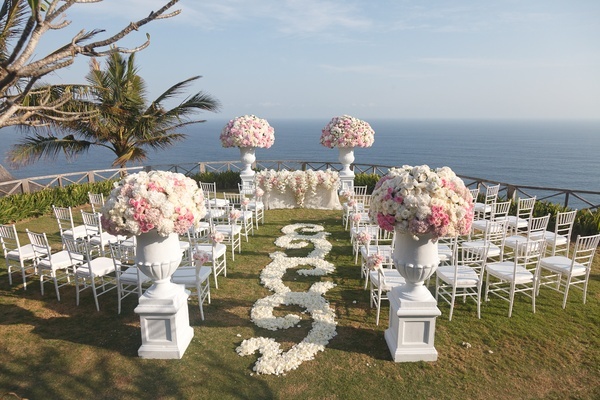 Wedding planning spanned a total of 18 months and incorporated vendors from five different countries. 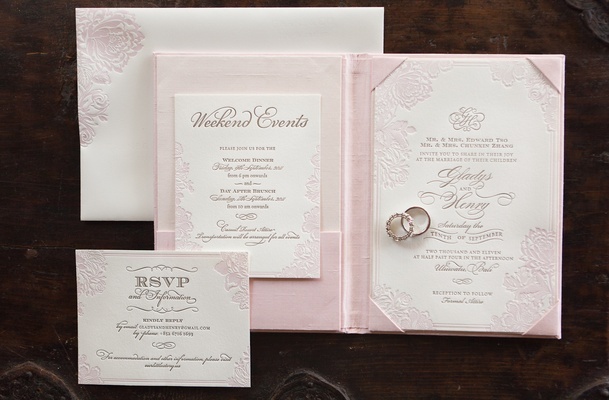 Stunning invitations that featured a floral motif in soft pink and antique gold offered a taste of the event to come, while concealing the exact location of the couples’ nuptials. 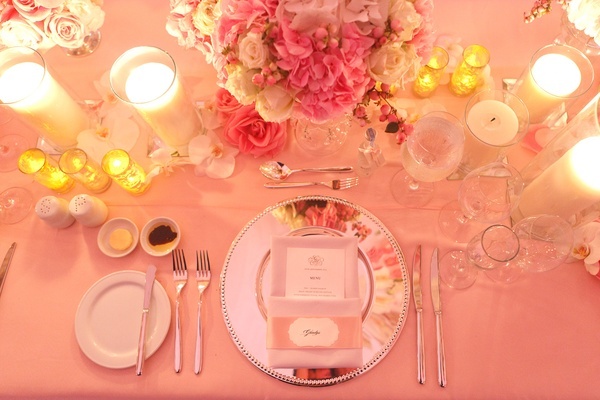 Once attendees were installed in their lodgings for the weekend, they were collected via prearranged transportation and escorted to and from various events, including a poker-themed rehearsal dinner, a day-after brunch, and a game of golf. 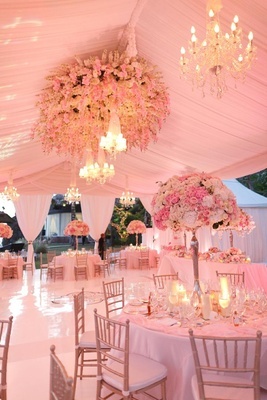 “It would have been no fun at all if everyone had researched the venues inside and out in advance,” explains the groom. 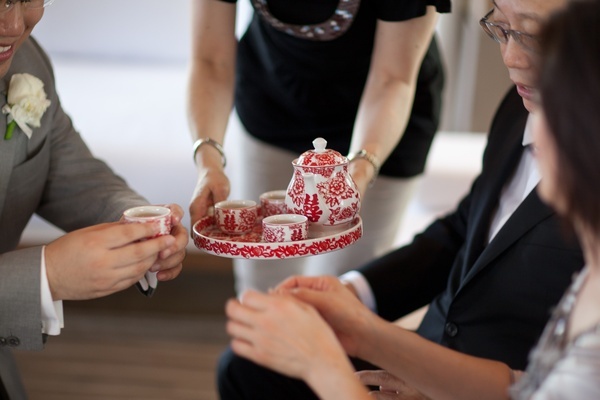 A traditional tea ceremony was held at noon. 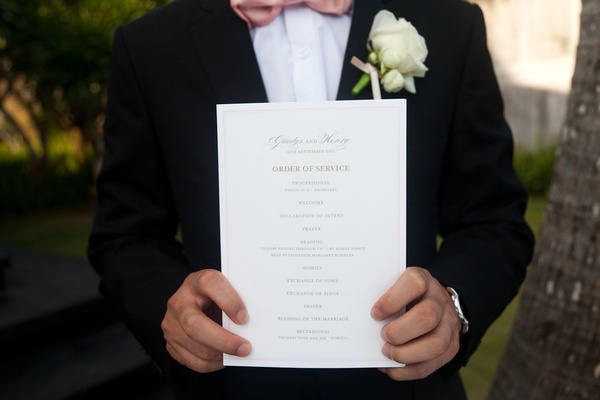 “The bride and groom serve tea to both sets of parents in exchange for words of wisdom,” explains Gladys of the cherished ritual. 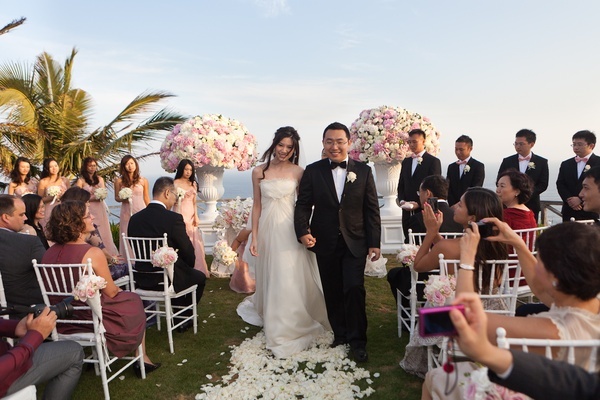 A vision in the first of four gowns of the day, she wore a custom designed blush qipao that featured beautiful details of antique lace for the tea ceremony, while Henry was attired in an ash-grey suit with a black bowtie. 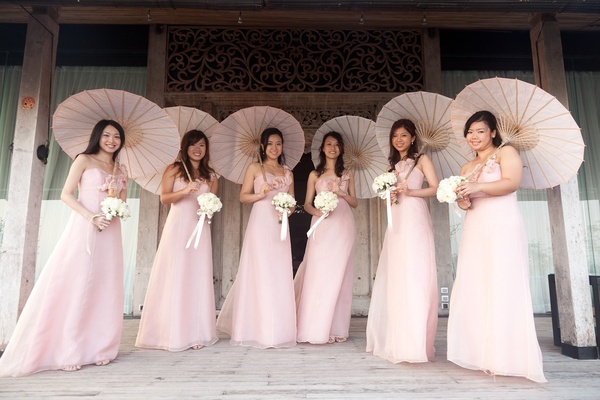 “It was important to us to honor our parents and show respect for the Chinese tradition by including this ceremony,” affirms the groom. 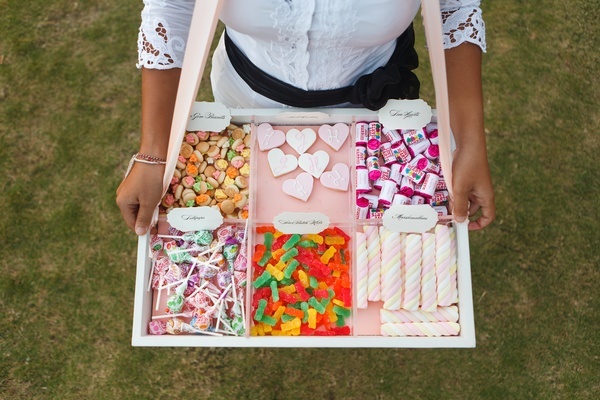 Tempting canapés, flutes of Dom Perignon rosé, and sweet candy treats gratified guests’ appetites during the cocktail hour held between the ceremony and reception. 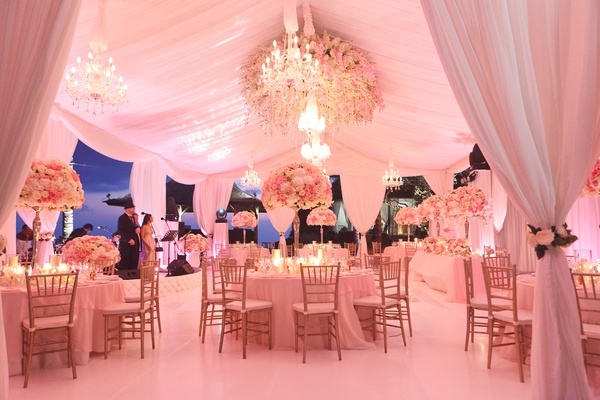 The latter celebration transpired in an impressive marquee draped with billowing fabric and illuminated with soft, romantic lighting. 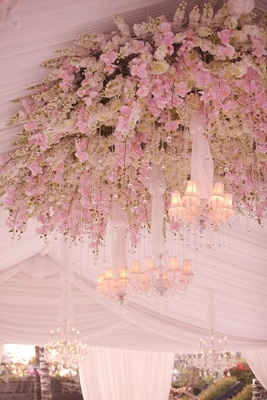 Chandeliers and delicate crystals cascaded from a grand floral arrangement overhead, suspended just above a custom dance floor that showcased the couple’s monogram. 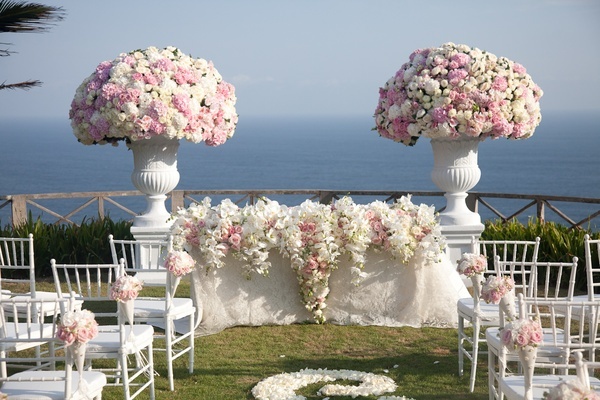 Floral arrangements in elongated, silver stands rested in the center of round tables that had been draped in pink chiffon. 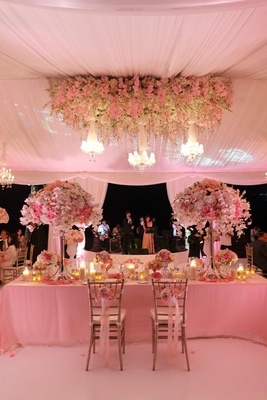 The newlyweds enjoyed the evening from a sweetheart table centrally located to provide them with a perfect view of the gorgeous décor as well as the loved ones who surrounded them. 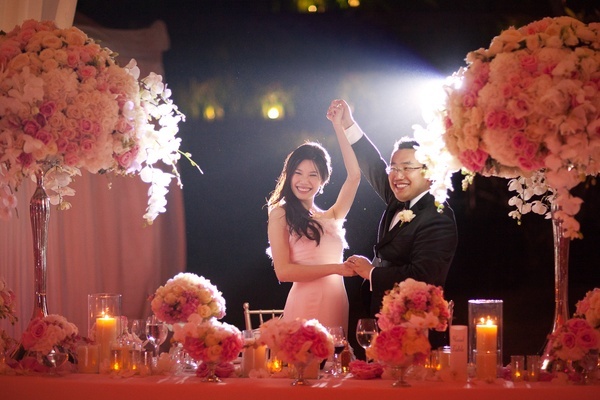 During the reception, the bride revealed two additional stunning styles including a second, more voluminous wedding dress for the couple’s first dance, and a soft pink evening gown for the conclusion of the occasion. 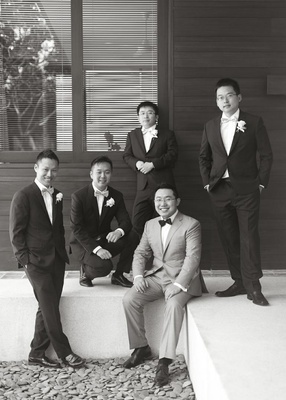 Throughout the festivities, guests were entertained by a five-piece jazz band from Hong Kong, a variety of vocalists, and a trio of opera singers from Australia – a surprise highlight of the evening courtesy of the bride. 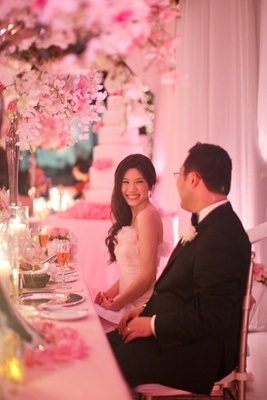 “Everyone was dancing, even our normally shy parents,” remarks the groom. 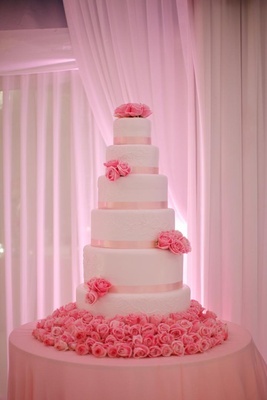 The couple’s soaring wedding cake was encircled with pink ribbons and placed upon a platform of roses. 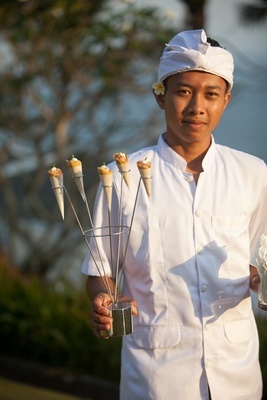 A dessert buffet housed in a separate, adjacent tent was unveiled following the cake cutting. 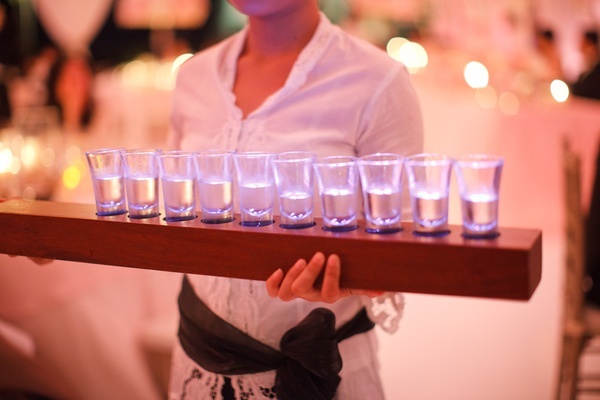 At the conclusion of the evening, miniature bottles of spirits were provided to guests as favors: Belvedere Vodka for the gentlemen and The Macallan for the ladies.